Accrington Stanley have signed Northern Ireland Under-19 international striker James Gray on a one-year deal following a successful trial at the Crown Ground. The 20-year-old came through the youth system at Middlesbrough and played for Darlington and Kettering in the Blue Square Bet Premier last season. 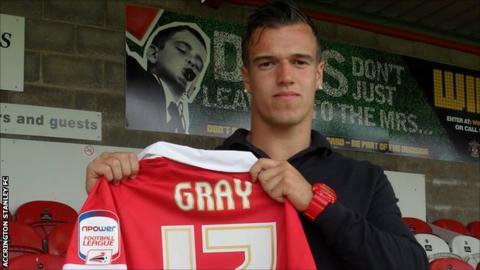 Gray told the club website: "I am not expecting to be in the starting line-up straight away. "Hopefully I can push my way in and cement a place in the team." Manager Paul Cook added: "We're looking forward to working with James. "He's impressed us in his time at the club so far and we feel he can improve on what we've seen so far."